Got some detailing work on a couple of vehicles for the junkyard on my diorama. 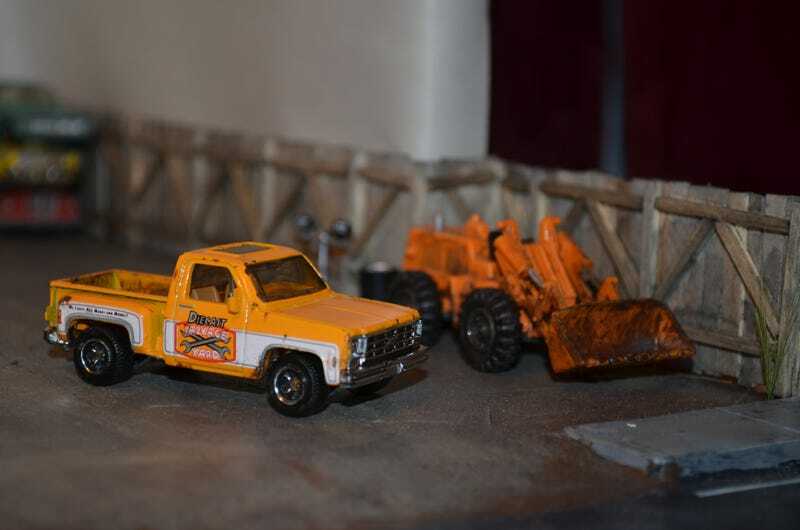 The pickup is a Matchbox, and the loader is a Tomica. The loader is a Tomica Furukama Loader. While it is a bit small, it fits better with the size of the diorama than a bigger unit. Eventually it will get forks for carrying cars, and a real counterweight so it can carry a diecast without falling forward. The pickup is a Matchbox stepside, and came with the tampo & paint scheme you see here, which is why I wanted it. When I found it at the flea market it was pretty chipped, so those chips became rust spots. And some dirt & grime was added to the wheelwells & bed. I’m really happy with how these came out, and they make me want to get more done on the diorama.